To the incredible mountain region of Peru called the Huascaran (pronounced Wa ska rarn) and explore with us the Cordillera Blanca (White Mountains). 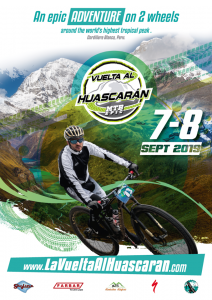 This Mountain Bike Race and Ride Tour starts with the La Vuelta Huascaran 2 Day Stage Race (for Elite and Sport level riders, Solo and Teams) around the renowned Huascaran circuit, this traverses the Majestic Punta Olympica (4736m) ,Portachuelo de Llanganuco (4769m) passes and weaves through all the valleys and mountain giants in this amazing part of the world. From here we leave the Huascaran region and take you to ride the Peruvian Single Track around Cusco and the Sacred Valley while discovering the historical centre of the Incan Empire. We ride the stunningly beautiful trails in this part of the Peruvian Andes including the Legendary Abra Lares trail, the Majestic Abra Malaga trail (Inca Avalanche) and the Patacancha trail (Worlds Highest Enduro race course). This is a spectacular trip, starting with an MTB event around Worlds Highest Tropical Mountain Peak (Mount Huascaran 6786m), then visiting the World Heritage City of Cusco (3399m) and riding the Sacred Trails in the Valley of the Incas before leading you to an unbelievable finish at one of the seven wonders of the world, the ancient Inca City of Machu Picchu. 15 Days/14 Nights – Special Intro Rider Price: $3995 USD Per Person (everything included) – Skill Level: Advanced Fitness Level: Intermediate/Advanced (you currently ride or can ride 200k+ a week with ease) – Group Size: 4 rider minimum, 12 rider maximum. Note about Fitness and Skill levels: All riders receive a (minimum 8 week) training program for the tours. If you are currently a beginner Fitness level rider (100k per week), but want to do this Intermediate fitness level tour. As long as you make a commitment to train to prepare and get to the (200k per week) level we are happy to have you join us on this tour. Skill Levels. You must be an experienced MTB rider with advanced skills to ride this tour. 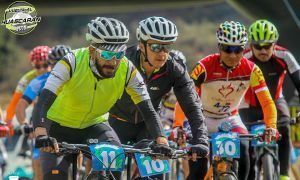 What is a Beyond Andes MTB tour? Our MTB tours are for people that regularly ride their MTB’s (Enduro/Single track/Downhill Cross country). This is a MTB Race and Ride trip at the very Top of the World in Peru. Full suspension bikes (recommended) or Hard tails. Tyres for fast dry all conditions trails. This is a high altitude race and ride cycling trip and its important to spend some days to adapt and acclimate. 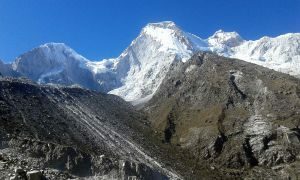 So we have 4 days in and around Huaraz (3000m). The first few days include some hiking then we begin to move a bit more and also have 2 short riding days so you ease into more activity. 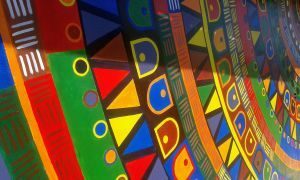 This tour has been carefully planned in such away for you to gradually adapt and acclimatize. 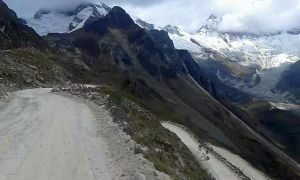 This morning we ride the Cojup Loop from Huaraz into the foothills of the Cordillera Blanca, a paved road climb to begin then dirt road. On the way we stop for lunch at the Yurac Yacu community (Lazy Dog) and then descend further to visit the Willcauain Ancient Ruins site believed to be constructed from 600 to 900 AD. We then take the short quick descent back to town. Tonight we stay in Huaraz. Active Rest Day short 22k ride in the morning. Final prep for race. Race Briefing is between 13:00 – 15:00 hours in Huaraz. Bring your camp duffle bags that you would like to be transported to the Race campground in Wecroncocha. The race begins at Laguna Chinancocha beach, Llanganuco Lakes, Yungay district. 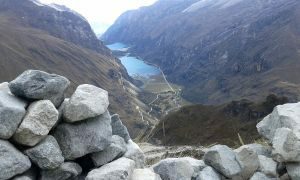 The route follows a serpentine gravel and dirt road, passing the two large Llanganuco Lakes and climbing approximately 1350 meters of altitude in 20 km to the Portachuelo pass, winding upwards beneath the glaciated peaks of Huandoy, Huascarán, Pisco, Chopicalqui and Chacraraju. From the Portachuelo pass at 4769m the road begins a long descent to Vaqueria and eventually Yanama in the Callejón de Conchucos, with several steep single track sections along the way. The Sport category riders finish in the village of Yanama (sport riders are then transferred by vehicle to Wecroncocha) The Elite riders battle up the last climb of the day, approximately 8 kilometers more to reach the Pupash pass at 4050m. The decent from the pass is a mix of dirt road and single tracks until reaching the finish line in the Wecroncocha camp. Stage 2 departs from the Wecroncocha campsite iwith a 20 km dirt road descent, passing through the quiet village of Sapcha which precedes a section of single track. Upon arrival in Acochaca, the road turns to pavement and a gentle 12 km climb towards the Jambón/Chacas intersection where the day’s uphill battle begins. Both categories will veer off towards Viscas on dirt roads once again and eventually single tracks to bypass Chacas and hit the final aid station in Huallín. At this point, the Sport category turn left and descend on a paved road descent to Chacas where they finish their race. The Elite riders turn right in Huallín and dig deep for the final 20km climb to the highest tunnel in the world at Punta Olímpica (4736m). Beyond the tunnel, a long winding paved descent connecting to some fun, technical single tracks eventually leads to the finish in Carhuaz 47k later. This morning we fly from Lima early to Cusco (1.15hr). Check into the Hotel and rest. We rebuild our bikes. Later we take in Walking tours of Cusco and sample the Cities International Cuisine. Sight seeing around Cusco with walking and Guided Tours of Cusco City ancient sites (including Qorikancha, Qinqo, Saqsayhuaman and the San Pedro Market). We ride the foothills of Cusco City including some nice single track and descend back to the city. Late in the afternoon we transfer to Calca in the Sacred Valley. Tonight we stay in Calca. We awake early and start with a transfer up a stunningly beautiful valley into the mountains to the top of the Legendary Abra Lares (4461m). This views of this area are amazing. We ride the Lares trail and descend for 2hrs and finish back in Calca. From here we and then transfer and continue along the Sacred valley town of Urubamba to share with a local family an authentic Peruvian Lunch. This afternoon we visit the Urubamba Market and later have a Guided Tour of the Maras Salt Mines and Moray. From here we do the second ride of the day on the Moray trail descending back to Urubamba. Tonight we stay in Ollantaytambo at 2840m. This morning we transfer early to the top of the Yanamayo Pass (4350 m). This ride follows the Worlds highest Enduro race course. Climbs, epic single track trails, rock gardens. A total elevation loss of 1800m in 29k. On the way stop at the Pumamarka Inca Ruin. Later we transfer to Santa Teresa (with an option to spin the legs out on the 2hr 77k road descent (Yes that’s not a typo) from the Abra Malaga into the jungle region of Santa Maria 1051m. Tonight we stay in Santa Teresa and soak in the stunning Hot springs. We awake early to transfer to the Hydroelectric where we then hike the beautiful picturesque flat 11k trail (2hrs approx) along the river and railway line to the Machupicchu village of Aquas Calientes. After lunch we visit one of the 7 wonders of the world. This afternoon we spend visiting the breathe taking Citadel of the Incas, Machu Picchu. We are guided for 2.5hrs then are free to explore for another 3hrs perhaps walking to the Sungate, or climbing Machu picchu mountain. We then say goodbye to this incredible place and take the train to Ollantaytambo and transfer back to Cusco. Tonight we celebrate with a Farewell Dinner Party in Cusco. The close off date to book this September 2nd – 16th Tour with a deposit is July 7th 2019. This tour is for Intermediate and advanced fitness riders only, and advanced skill level riders, NOT for recreational cyclists. You have a mountain bike and you ride it regularly. All riders are requested and expected to follow the training program to prepare for this tour. We want you to come on this tour prepared so you will enjoy it more.